Bioware for making a great game and for the original assets. 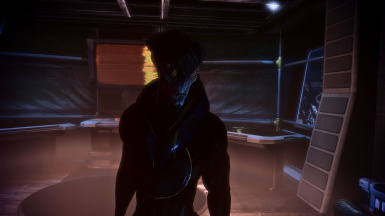 It always bothered me that Javik was always in his armor, especially on places like the Normandy. Although, I could not do anything about it seeing as his armor model was the only one for Protheans used in the game. However, after playing through Priority: Thessia, I realized I was mistaken. It turns out the VI used a different model than the regular Prothean one. I decided to use that one in this mod. This led to many days in Blender trying to make the mesh work for Javik. 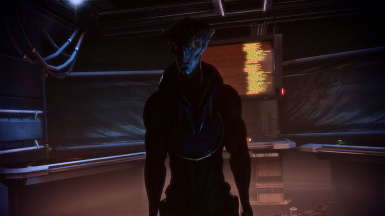 After many days, I am somewhat satisfied with the result Javik will now be wearing his new casual outfit on the Normandy, the Citadel, and during Citadel DLC if you have it. This mod requires the From Ashes DLC to work. Installation should be simple due to the mod being a DLC mod. 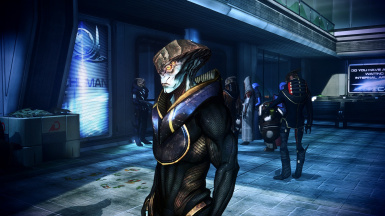 Just put DLC_Mod_Javik in Mass Effect 3\BIOGame\DLC. Feel free to use the mesh in your own mods. All I ask is that you credit me. You don't have to ask in advance. 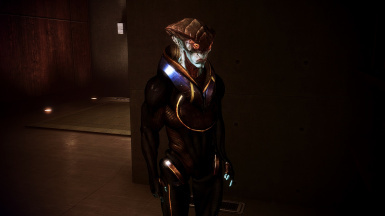 Javik will still wear his armor and bring weapons during the Casino Infiltration mission in Citadel DLC. I am still trying to figure out why this is. Once I do, I will update this mod accordingly. There is also a gap between his neck and the outfit, but it is not really noticeable. The only time you would notice is when the camera gets really close to Javik. If any modders want to help me with this, please PM me. I mounted this DLC mod really low to avoid compatibility issues. DLC content mods are unlikely to touch the pcc file I modified anyway. As far as I Know, none do. Any mod that modifies the same pcc files will be incompatible.